The Interlocking hearts design cake knife/server set scored high marks above the rest of the cake server sets we looked at and is our overall top pick. This beautiful interlocking hearts design is sure to be a hit with the bride when she sees it. The knife measures 12 1/8” x 1 and the server measures 9 ¾” x 2. This is the perfect addition to a heart-themed wedding or party and is packaged on a clear-lidded box that features a gray and white design base for safety. A cake server is a necessary part of every wedding. Couples put a lot of thought into the cake server set they will use during their cake-cutting. The great thing about this server set is that you will be able to use it after the wedding too for serving desserts and cakes no matter what occasion. Think about how many times each year you serve or have dessert. A long lasting, beautiful cake server set is something that will be used often and for decades to come and can even be passed down to your kids. The different kinds of server sets available are huge. They are available in many different styles and finishes. Trying to find the right set for your big day can be really overwhelming if you don’t know what is out there. We have reviewed three top-rated cake server sets below that are very popular with consumers for their beauty, ability to be engraved, and their usefulness as well. All three of these server sets make a statement and will be a great addition to your wedding and to your home afterwards. We have also included a buying guide that will give you some information about the different types of cake server sets available, what they are made of, and how you can sort through the different sets available and choose the one that will fit your personality and your needs as well. We spent 30 hours researching and testing more than 15 different types of cake server sets and found that style, function, and ability to be engraved were the most important factors when it comes to consumers who were shopping for cake server sets. This beautiful interlocking heart design is one of the most popular cake serving sets on the market. This design is from the Finishing touches Collection that features handles made of white poly resin with interlocking hearts and a stainless steel server and stainless steel knife blade. 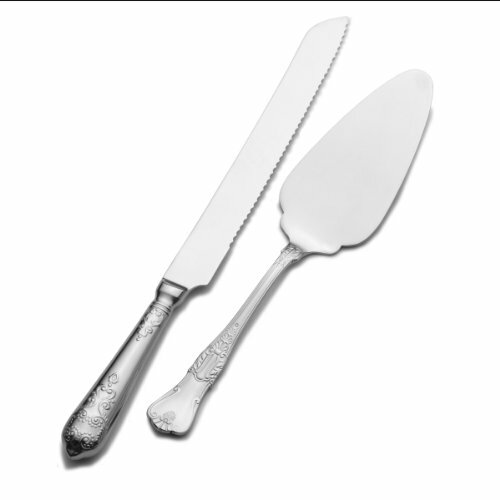 The measures of these two beautiful accessories are 12 1/8” x 1 for the cake knife and 9 ¾” x 2 for the cake server. The handles fit comfortably in your hand for easy cake cutting and dessert serving. This lovely cake serving set comes packaged in a box with a clear lid and damask design in gray and white to keep them in when you are not using them. The case protects this beautiful set from scratches and damage so you will have them for a long time to come. The delicate off white matches any color scheme you have chosen for your wedding and adds a beautiful flair to holiday dessert serving as well. This popular cake serving set gets its design from Europe’s grand hotels and has been reproduced in stainless steel to create a serving set that is not only functional but incredibly elegant too. You can use this simple but elegant cake serving set for any occasion whether it is formal or not. It is perfect for serving pies and cakes during the holidays but is not so delicate that you won’t be able to use it when you’re serving pie to the kids. This set includes a cake and pie server and a cake knife. Both pieces measure 12 ½” long. You will never need to polish this set and it can even be washed in the dishwasher with no damage at all. This long lasting cake server set is the perfect gift for a newly married couple who loves to entertain. Lenox is a well-known name in fine china and flatware and this beautiful bridal cake server set is no exception. The beautiful Adorn design features a ribbon design that has been made of silver-plated metal. It is a perfect choice for the cake cutting at a wedding and goes well with any color scheme and theme. The cake knife measures 8 ¾” and the cake server is 8”. It is a little smaller than some other cake serving sets but still fits comfortably in your hand as you are cutting and serving. The mirror like finish requires no polishing to stay looking brand new. It is perfect for the holidays as well and makes a great gift for a couple in their first place. The three top-rated cake server sets we have reviewed above are all perfect for your special wedding day or to serve desserts during the holidays or for any other occasion. All three are made from sturdy and long lasting stainless steel with elegant designs on the handles of the cake servers and the knives. Taking the time to choose your cake server set carefully is always a good thing since this set will forever remind you of your special day and will be a memento that you can pass on to your own children if you choose to. If you are ready to purchase a cake server set, whether for your wedding or for holiday dessert serving, choosing one of the three top rated cake server sets we have reviewed above is a great place to start. If you don’t see what you’re looking for yet, take a look at 7 additional designs that we have listed below for you to consider. The cake cutting tradition dates back to the Roman Empire when the groom would actually break a loaf of bread over his new bride’s head. This is not exactly romantic but fortunately things have changed over the centuries and now one of the traditional and most-looked-forward-to events at a wedding is the cake cutting ceremony. Most couples choose a special cake server set to use for that special ritual. There are so many different styles and types of cake serving sets available that it could take a long time to sort through them all and find the perfect set for your wedding and beyond. The cake server set is displayed on the wedding cake table so choosing a set that means something to the couple and complements their personality and style is paramount. Cake server sets can be personalized with engraving such as the date of the wedding, their names, and anything you want to put on there. Although a cake server set is not the most practical kitchen item, if you entertain a lot and do a lot of baking, you may find that you are using your server set often. Cake server sets come in all different shapes and sizes. The majority of sets include a cake knife and a matching cake server. These pieces can range in size from 8” to as long as 13” long and is up to personal preference. If the bride has small hands, a set that measure closer to the 8”-10” size may feel more comfortable. Believe it or not, the shape of the cake server set you choose has a lot to do with the shape of the wedding cake. Most sets are one of two basic shapes: triangular or square. If the cake you are serving is round, a triangular server will work much better. For square cakes use a square-shaped server. There are some server sets that feature more rounded blades and this is fine as well. The shape of the cake server set is the least important feature of the set although choosing a set that features a wider server blade can make it much easier to serve dessert in the future when you are hosting gatherings and holiday parties. The sets with thin serving blades can lose a lot of slices of cake that topple right off the thin blade. Another thing to consider is the shape and size of the handle. You want to find handles that are easy to hold and that fit in the hand comfortably. Your nerves and all the excitement are already going to have your hands jittery so having to use a slippery or thin little handle to cut your cake could cause a lot of frustration. Thicker handles are easier to hold and maneuver especially since both of you will be holding the handle and cutting together on your special day. The cake knife part of the server set can vary in sharpness but most are not super sharp due to the fact that you are cutting cake with them and cake is always soft. Some may have tiny teeth but the majority is smooth along the cutting blade. The blade may be mostly straight or can have a curve to it as well depending on the style of the set and the manufacturer. Despite the fact that the cake knife is typically not sharp, it can have a sharp tip so keep it out of reach of children for their safety. Even dull knives can cut and cause injury. It may also benefit you to look for a set that has a wider knife blade which is usually better to cut cake since most cake is not thin. There are three basic materials that are used to make most cake server sets. These are stainless steel, gold or silver-plated, and sterling silver. Of course there are plastic ones as well but those are not meant for weddings and holidays they are most often used for get-togethers or even outdoor dessert serving. The least expensive of all the materials is stainless steel but it is durable and long lasting and doesn’t require any special polishing. Some stainless steel sets can even be washed in the dishwasher but if there are fancy designs on the handles or engraving you may be better off just washing them by hand. Sterling silver is the most expensive and will last forever but real silver requires additional care to keep it looking beautiful. They are not as common as stainless steel sets because they are so much more expensive but if you are lucky enough to get or find a sterling silver set, hang onto it and cherish it! Silver and gold plated sets are also pretty easy to get with silver-plated being the more popular of the two kinds. Care must be taken with some silver and gold plated sets due to the plating that can flake off over time if it is not taken care of properly. One of the most popular ways to make your cake server set truly yours and special is to have it engraved. You can engrave anything you want on the blade of the knife and server but the most traditional things that are engraved include the wedding date and the names of the bride and groom. If you are looking for sets that are truly unique you can search online for almost any style of cake server set you want. Because they are so important for weddings, more manufacturers are creating different and unique styles that can go with a number of different themes and wedding venues. 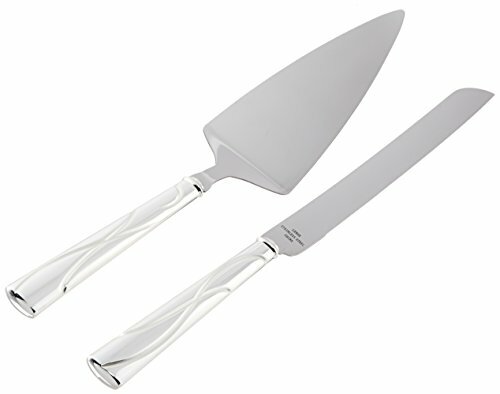 Cake server sets are one of the most popular things a bride and groom to be will choose for their wedding. They come in many different finishes and styles and can have any number of different embellishments on them from hearts to wedding rings to flowers and ribbons. With all of the different styles available it can be really tough to decide on ONE special set for the wedding. We have reviewed three of the most popular cake server sets above that are very popular with couples for their weddings and afterwards to serve desserts and of course for the cake cutting at the wedding. All three of these sets are made of durable and long lasting stainless steel that requires no special polishing or care. The overall top pick and the Lenox design should not be put in the dishwasher but the Ateco set can be washed right in with the rest of your tableware. All three of them can be engraved to personalize them and make them even more special. If you have not found what you’re looking for with any of the top rated cake server sets we have featured, the information we have provided in the buying guide will help you understand all the different materials, styles and shapes available so you don’t become frustrated when sorting through them all. This information will make it much easier to find a cake server set you love. Some people choose one set for the wedding day that is then boxed and put away as a memento and then they will purchase another set that is more day to day ready that they will use for the holidays and every day dessert serving. Keep in mind the points we have made in the buying guide such as how to care for your cake server set properly depending on the material that it is made from, and that different sets will cost higher than others based on those materials. Your wedding is a special day and choosing the right cake server set with care will mean a lot when you take it out to use it for the holidays for years to come.